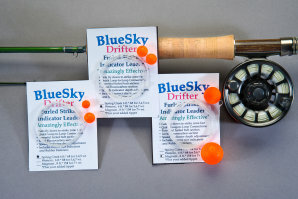 Home / Trout / DRIFTER – Furled Strike Indicator Leaders. DRIFTER - Chose style Choose an optionMagnum for 7+ Wt.Spring Creek for 3,4,5 Wt.Western for 5,6,7 Wt. instructions included. Additional indicators available (below). Magnum for 7+ Wt., Spring Creek for 3,4,5 Wt., Western for 5,6,7 Wt.